The busy times are starting up again for many meteorologists in the Northeast. Usually in late March we are dealing with temperatures in the 60s and rain storms riding up the coast. Because this winter has been one of the most extreme and surprising in almost 100 years, it is not a surprise that we will be dealing with temperatures 10-20 degrees below average for the next 3 weeks or so. I have a feeling that it will only hit 60 degrees a 2 or 3 times in the next 20 days. The nice weather pattern we have been in for the last month is breaking; the NAO is in the tank and the PNA is rising, both signs of storminess and below average temperatures. I also want to talk about the snow coming later tonight into tomorrow. We are generally looking at 1-4 inches of wet slushy snow. Some back-roads could be slippery tomorrow morning as well as tomorrow evening when the storm wraps up and brings the cold air back in. We have another storm Sunday that is looking to bring a more 2-5 inch snow mostly falling during the day. 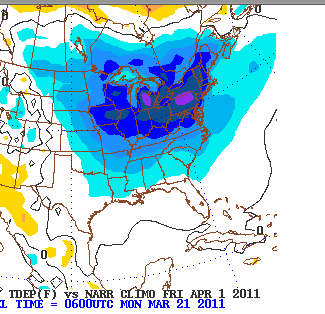 Then we have another on next Tuesday and Wednesday that is looking to be big. Right now most models are showing it out to sea, but I have a feeling, based on the NAO values tanking, that the models will bring the storm west and give us a significant snowstorm. Just be aware that we have a chance, in spring, to be snowed in once again with school closings and other snow cancellations.